The demographics profile of New Canaan shows two significant deviations from US averages. Home ownership becomes necessary for adults after the age of 25, but ceases to have utility after children grow up after the age of 59. 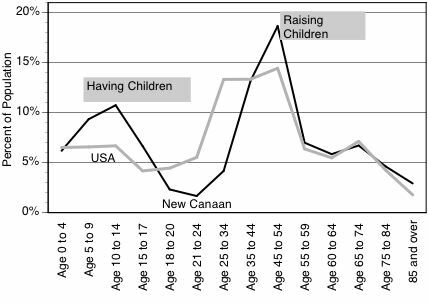 CONCLUSION: Demographics, housing occupancy and social life is centered around New Canaan children. The consequence is high home ownership turnover and retirement years that are slightly better than national averages.